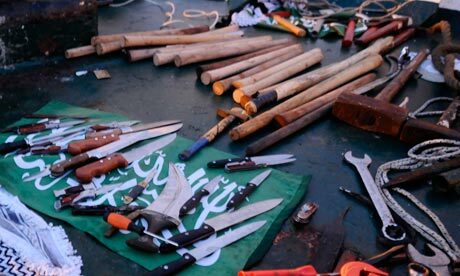 Some of the weapons used by the so called Peace activists, i.e. terrorists. May 31, 2010 six civilian ships are heading towards Gaza to provide them with military supplies to help in the fight against Israel. The Israeli navy stops the ships for inspection. The "activists" (or terrorists) on board attack the Israeli Navy. Even the organizers of the pro Arab group admit that the Israelis only used force after their lives were in mortal danger. "According to flotilla organizer Greta Berlin, the Israeli soldiers didn't start firing until an activist seized a gun from one of them". Ten Israeli soldiers were hurt, one quite seriously. Israel has come under attack. I am not referring to the attack on our soldiers by armed enemies masquerading as "Peace Activists". I am not referring to our law abiding soldiers who entered a ship bringing supplies to our enemies and then, unprovoked, were brutally attacked with crow bars, baseball bats, sling shots, knives and eventually live fire arms. I am referring to the attack on the State and People of Israel by the world. This attack is of course unjustified and uncalled for. Photos and live footage clearly show the true picture, but our enemies, including, most tragically some enemies from within, refuse to be objective. For them it is just another opportunity to gang up against Israel. My friends, we do not live in a world of truth. The truth is considered a commodity of little value in our world. Slick public relations and clever advertising is much more valued. Being armed with the truth is no longer enough. The truth stands alone with very few takers. As a child I learned the truth very quickly. It was explained to us that if one of us is sitting on a bus and an elderly person boards the bus, when no seat is available, we must get up for them. We must get up because our Torah, the Bible, tells us "Honor the elderly". But there is another reason we were taught. We were taught we must jump up, "Be the first to offer the elderly your seat, for you are clearly identifiable as a religious Jew. If you are not the first to get up, people will say, 'look at that religious Jew, he does not behave properly.'" I was taught, and understood very early on, that as Jews, as the People of Israel, our actions will be analyzed and put under a microscope. Any wrong doing will be exaggerated and blown out of all proportion; therefore we must always be on guard. 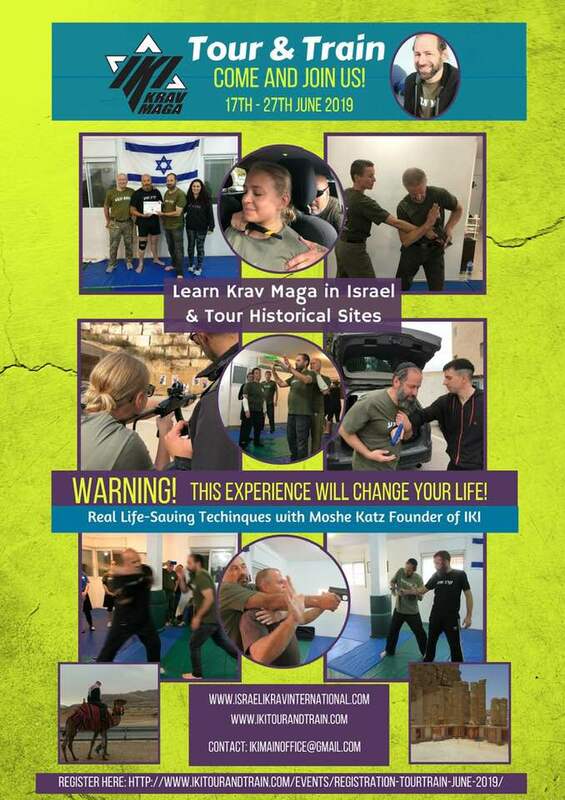 This attitude, which has been ingrained in me since my earliest years, has a direct impact on how IKI, Israeli Krav International, conducts its business. Policies will always be fair and made clear. Fees and dues will always be fair and clear, there will no unpleasant surprises. You will get more than what you bargained for. Both in terms of techniques and in terms of training, we will always strive to offer only the very best. This is not only our policy, it is our way of life, it is our belief system. We know that all our actions are being examined under a microscope. We know that, as the rabbis say, we need to be "clean in the eyes of God and of Man."